Woman empowerment has been one of the primary focuses of Ajmal Foundation. The organization has been functioning in modern education sector since its inception days. In order to reach out to a larger section of women in the society, Ajmal Foundation seeded its first college for women- Maryam Ajmal Women’s College of Science & Technology, Hojai in the year 2006 and then in 2011, Maryam Ajmal Women’s College of Arts, Hojai was established. Maryam Ajmal Women’s College of Science & Technology. Maryam Ajmal Women’s College of Science & Technology is blossoming as the finest flower in the garden of Ajmal Foundation with its higher secondary section established in the year 2006. The college has come to symbolize the unwavering commitment of the Ajmal’s towards social reconstruction through modern science education on the one hand and their deep reverence of Ajmal Brothers to their beloved mother- late Maryam Un Nisa Ajmal, whose memory they wish to perpetuate empowering women to be participants in the rapidly changing scenario of scientific and technological revolution sweeping the world today. With this vision and magnanimous struggle and hard work of many people was born Maryam Ajmal Women’s College of Science and Technology (Degree) on 16th July, 2012. It started its journey with affiliation from one of the most prestigious universities of Assam; i.e. Dibrugarh University. It began with only 44 students admitted to B.A and B.Sc courses and today we have more than 300 students studying in various major subjects like English, Assamese, Education, Chemistry, Zoology Botany, Physics and Political Science. To fulfill the needs of the masses we applied for major subjects like Mathematics and major in this subject will be offered from the coming session. Nazir Ajmal Memorial College of Education established by Ajmal Foundation in the year 2014 has been imparting Teacher Training and Research to equip them with the appropriate knowledge, habits, attitudes and values. This will not only develop the necessary competencies as a teacher but also create a desire for lifelong learning and to reach the unreached. With this mission, Nazir Ajmal Memorial College of Education has emerged to instil in the teachers the urge to be creative and innovative to make them fit to the present-day technology-oriented classrooms, teaching & learners. The College was established in the fond memory of the beloved Late Nazir Ajmal, the youngest of Ajmal Brothers, who passed away prematurely. The College is recognized by National Council of Teacher Education (NCTE) and affiliated to Gauhati University. Maryam Ajmal Women’s College of Arts, Hojai was established in the year 2011 under the aegis of Ajmal Foundation, to impart education in the field of Arts to the girl students of the North East India. After the establishment of Maryam Ajmal Women’s College of Science and technology, it was felt within the organization that the region is very much in need of an Arts College. A survey was conducted in the entire region and the feed-back and recommendation suggested in favor of setting up an Arts College for girls of this region. The Ajmal family in no time took some immediate decisions in favor of setting up of the college. Thus the college came into existence. 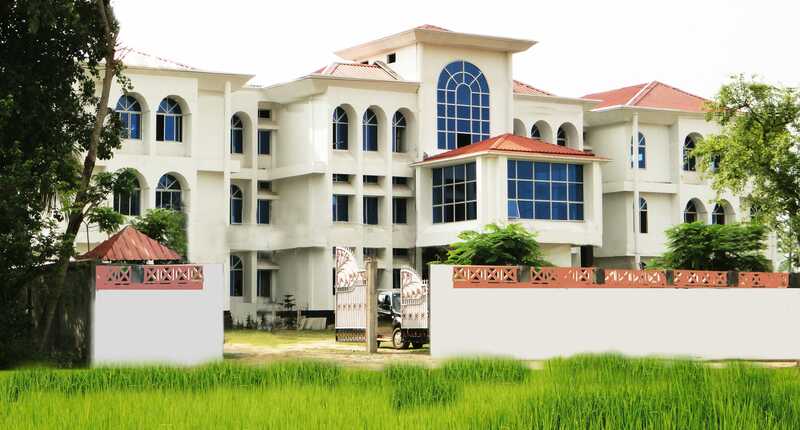 Maryam Ajmal Women’s College of Arts, Hojai is an institution with a difference. Besides assuring academic excellence, we value individualism, creativity and innovation and strive to nurture them in our students. Since its inception, the college has been doing wonderfully well with its results. The unconditional service rendered to the unprivileged girls has earned accolades from every corner of the society. The institution has the reputation of bringing about comprehensive change in the personality of the students who go on to get admission in such prestigious institutions like the Jamia Millia Islamia, Delhi with a dedicated diligent and caring staff. We are always at the service of the society. Markaz Darul Yatama, located at Kachua was established in 2004 with 75 orphans (Girls). The reason behind the establishment of this orphanage is a sad reality. The poor Muslim families living in that area used to work for their bread and butter in the local tribal people’s houses. The Muslims used to take loan from these people but due to some reason or the other, they were not able to repay the loan amount. Thereafter, they used to sell/give their own small child especially girls to the tribal people. They used these girls for their benefit. Once, Honourable trustee, Maulana Badaruddin Ajmal came to know about these incidents, he went to these tribal people’s home to give them their lending amount and freed the girls. They were then taken to this orphanage for a better future. Total Area— 201600 sq ft.
1. 8 girls completed HSLC. 2. 30 girls completed Hifz. 3. Many got prize under the board of All Assam Tanzim Madaris Qaumiyah. 4. Some are serving Islam in different Makatib. Markaz Darul Yatama, Goalpara (Girls) is a unit of six orphanages run by Markazul Ma’arif (Part of Ajmal CSR), Hojai, established in 1993. Due to numerous incidents of ethnic violence, many girls became orphans and there were none to look after them. Reportedly the economic status was so bad that their guardians used to sell the orphan girls for a few hundred rupees to rich households. Thus this orphanage was established to provide a safe haven for these poor and destitute girls. There is a school present inside the orphanage known as ‘Markaz Academy’ where classes from 1st to 10th standard take place. Total Area— 194400 sq ft. Many got job in govt. and private sector. Others are serving Islam in different Makatib. Ajmal Free Coaching is implemented under the Ministry of Minority Affairs, Government of India. Here, free coaching is provided to girls (and boys) for Engineering, Medical and Civil Service examinations. During the years 2014-15 and 2016-17, 32 girl students benefitted from the program.